Livestreaming, breaking news notifications, and all the local newsyou want from FOX 5 in a fast, high-performance app. Watch and readstories at the same time -- the video plays as you scroll. Be thefirst to know with breaking news alerts, and find out what'shappening in your area with News Near Me. Never miss any FOX 5 news- you can livestream our newscasts right from your phone or tablet.Save stories to read later, and share easily to Facebook, Twitter,and other social networks. Get a head start on your day with FOX 5traffic and weather maps. Enter our latest contests and promotionsright from your phone, and catch up on all your favorite segmentsfrom FOX 5. Livestreaming, breaking news notifications, and all the local newsyou want from Chicago's Very Own WGN-TV in a fast, high-performanceapp. Watch and read stories at the same time -- the video plays asyou scroll. Be the first to know with breaking news alerts, andfind out what's happening in your area with News Near Me. Nevermiss any WGN-TV news - you can livestream our newscasts right fromyour phone or tablet. Save stories to read later, and share easilyto Facebook, Twitter, and other social networks. Get a head starton your day with WGN-TV traffic and weather maps. Enter our latestcontests and promotions right from your phone, and catch up on allyour favorite segments from WGN-TV. Livestreaming, breaking news notifications, and all the local newsyou want from FOX 17 in a fast, high-performance app. Watch andread stories at the same time -- the video plays as you scroll. Bethe first to know with breaking news alerts, and find out what'shappening in your area with News Near Me. Never miss any FOX 17news - you can livestream our newscasts right from your phone ortablet. Save stories to read later, and share easily to Facebook,Twitter, and other social networks. Get a head start on your daywith FOX 17 traffic and weather maps. Enter our latest contests andpromotions right from your phone, and catch up on all your favoritesegments from FOX 17. Livestreaming, breaking news notifications, and all the local newsyou want from FOX59 in a fast, high-performance app. Watch and readstories at the same time -- the video plays as you scroll. Be thefirst to know with breaking news alerts, and find out what'shappening in your area with News Near Me. Never miss any FOX59 news- you can livestream our newscasts right from your phone or tablet.Save stories to read later, and share easily to Facebook, Twitter,and other social networks. Get a head start on your day with FOX59traffic and weather maps. Enter our latest contests and promotionsright from your phone, and catch up on all your favorite segmentsfrom FOX59. 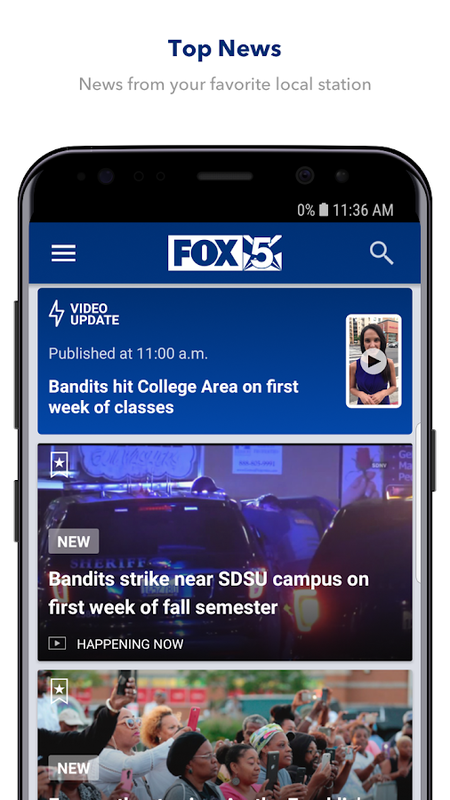 Livestreaming, breaking news notifications, and all the news thatmatters from FOX40 News in a fast, high-performance app. Watch andread stories at the same time -- the video plays as you scroll. Bethe first to know with breaking news alerts, and find out what'shappening in your area with News Near Me. Never miss any FOX40 news- you can livestream our newscasts right from your phone or tablet.Save stories to read later, and share easily to Facebook, Twitter,and other social networks. Get a head start on your day with FOX40traffic and weather maps. Enter our latest contests and promotionsright from your phone, and catch up on all your favorite segmentsfrom FOX40 News. Design - Flash Alerts have new light design follow material design.- Easy to use Flashlight notification for all Apps - Select any appyou want to enable flash alerts and will not miss anything Commonfeature ★ Flash alerts when has Call ★ Blink flash alerts when hasSMS ★ Ringing flashlight when phone have incoming Call, SMS andNotification ★ You can turn on or turn off app by manual overdevice status sound mode as Ring, Vibrate or Silent mode Advance ✔Allow change speed of flashlight alert ✔ Stop flash alerts withvolume or power key ✔ Turn off flash alerts when battery low, helpyou save battery ✔ You can set up the time to active the Flashalert Feedback - If you like Flash Alerts, please kindly rate 5stars and give us nice review Thank for your support!